Madame Samm at http://www.sewwequilt.com/ comes up with some fantastic ideas for blog hops, and coming up is the UR Priceless hop hosted by Katherine at www.sewmesomethinggood.blogspot.ca. After a slow couple of weeks I'm finally getting organised and have my first purse completed, but I had three purse clasps, here you can see preparations being made for the second purse. Evenings, when you're tired, are not the best time for starting a new cardigan that has a lace pattern. You make mistakes, and have to start again. Using a fluffy yarn when starting a new lace pattern, when you're tired means you have to start again. Having children that talk to you while counting stitches, in a fluffy yarn, on a new lace pattern is a disaster, you have to start again. Three attempts and two days, I finally get past the third row. The boys have now had their gags removed, and normal communication has resumed. 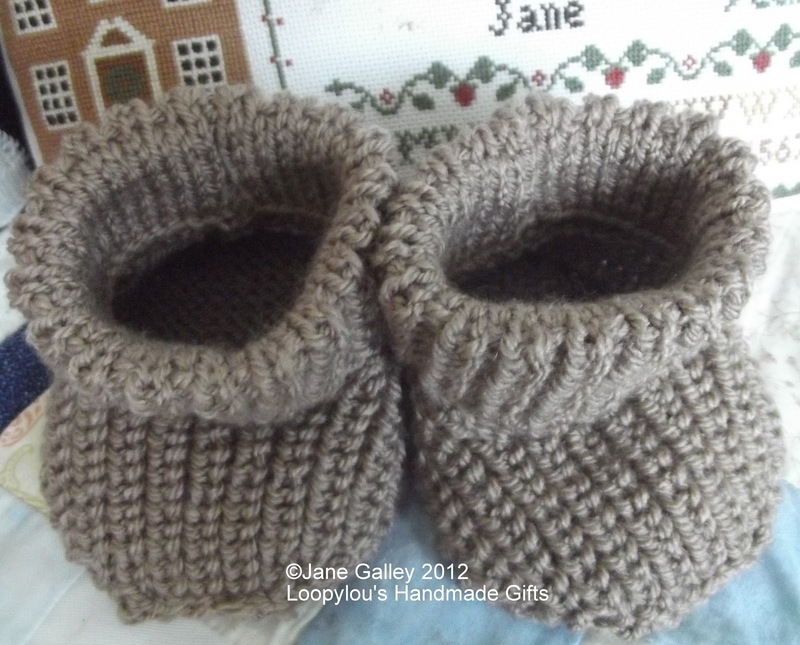 I just love these little slippers. 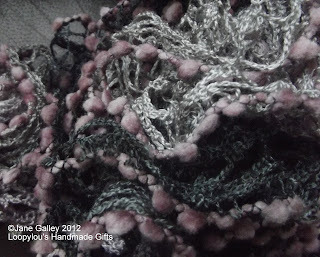 The whole process is so satisfying, seeing each individual part come together to form a slipper, fantastic! 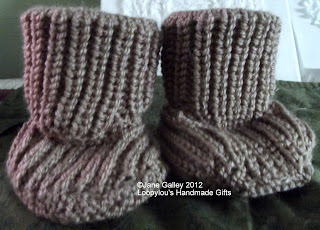 This pair has a shorter leg than the first pair, and went together better too. Practise has certainly paid off. I'm definitely going to make adult ones, but first, there is another style to try. I've been surprised at the variety of textures in each of these scarfs. 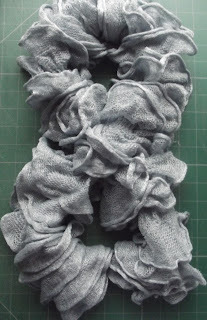 Although they've all have the same ruffle effect, they are completely different in texture. This one is like a net, and in reality, is ice blue. This is the last scarf I have planned, at least, for a little while. Time to start cutting, and removing threads. With woven bars, it still has quite a bit of substance. 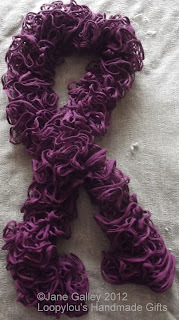 This one has a completely different texture to the first loopy scarf, not so fine, and no pompoms. 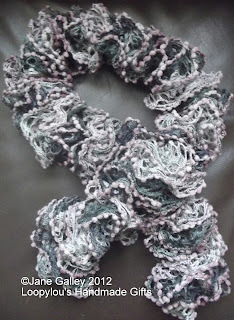 This one is knit using Loopy Creative, and is quite a bit longer. I have one more to do, and again, it has a different feel to these two. This is one of those pieces that you can't do unless you have a clear head. Not being well delayed progress, so the next instalment is out before I've done this one. Never mind, it's growing and different parts are getting filled in. This time, the blanket stitch border was added, and then then eyelets. Now, to get part six done before the next part is released on Saturday. I do have to catch up with the Hardanger SAL, but I can only do that in daylight. That means I need something to do in the evening, and, as I'm still in a knitting mood, I picked up something quick and easy to do. This is a scarf knit using Loopy Pompon. The little bobbles are so tiny, I love them. I have some more of these to do, but each yarn is a different texture, so it will be interesting to see how each one turns out. I did get to the end of the border, eventually, and then there was the small matter of sewing it on. 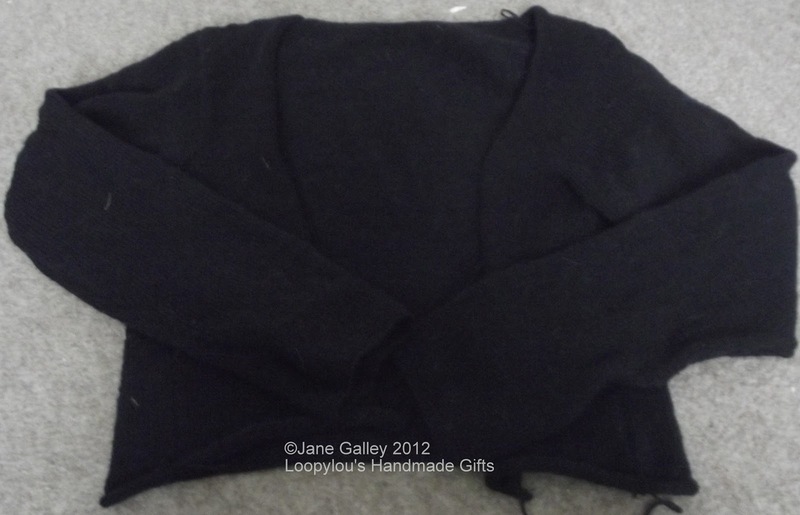 Surprisingly, it didn't seem half so long when I was sewing it on, that part seemed to go really quickly. 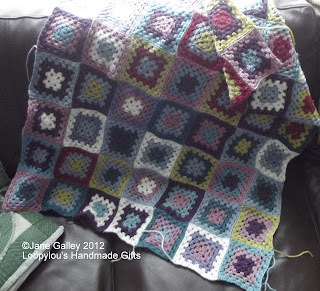 The border definitely gives all the bits their shape, and finally, it looks like a proper cardigan. 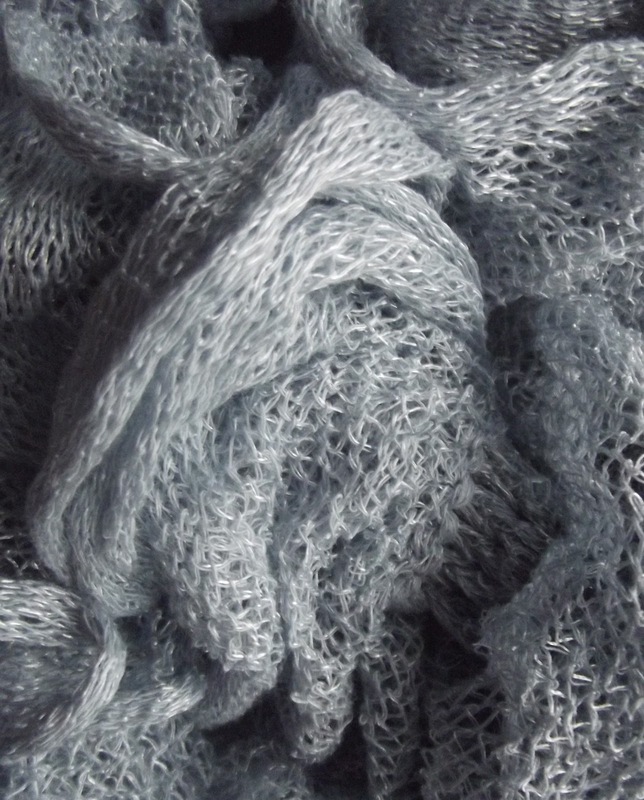 Being black, and wool, over the months it's been in the making, it's managed to pick up a lot of threads, so now it's been washed. 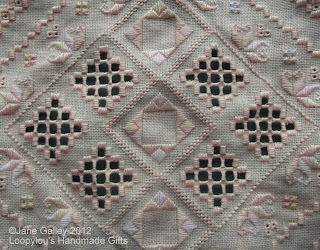 I shall block it, and it's ready to go, no buttons are needed for this one, so no delays. 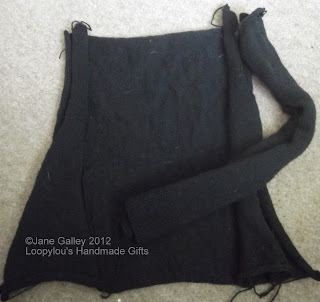 There is a version of this with three quarter sleeves, which I may do, but it won't be in black. It feels like one of those journeys that never seem to end. I knit, I measure and knit some more, and I still haven't got to the end. Like all journeys, it will end, and hopefully, today will be the day. 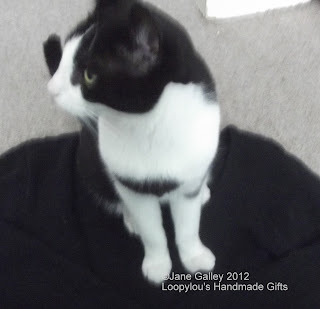 I thought I'd ease myself gently into the week and work on my cardigan. 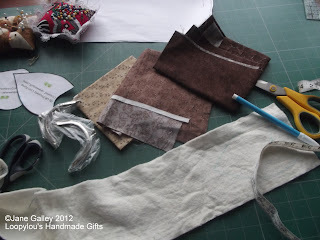 The sleeve was finished, and all the pieces sewn together. 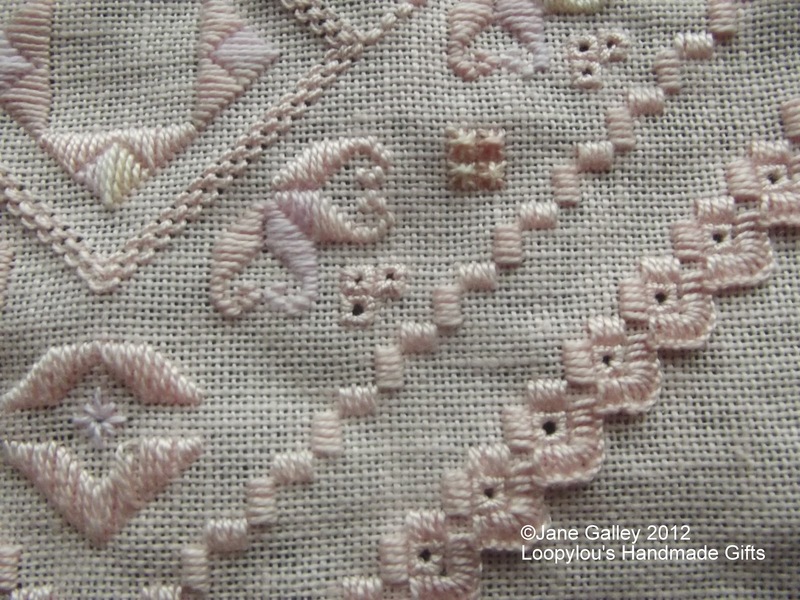 Now it looks more like it should, but it will need blocking once the border is on. 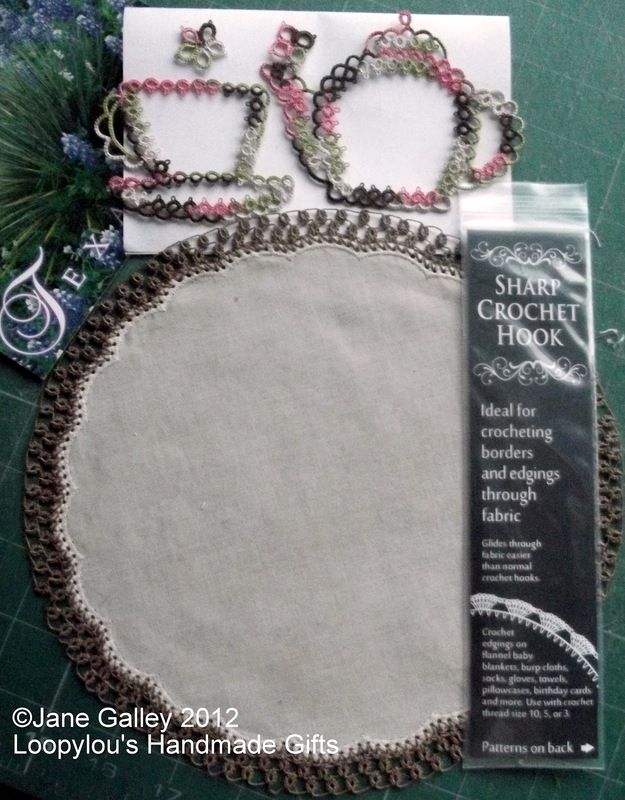 That's my next job, a very long moss stitch border. It has to go all around the cardigan, so it could take some time. After spending a day on it, I've still got to reach the halfway mark. All being well, it will be finished this week. There are a few times that I regret teaching the boys to be so generous and giving. This week is definitely one of those times, it was a week when I would have appreciated their selfishness in keeping their germs to themselves. Instead, they have very freely shared their sore throats, coughs and temperatures. As often happens, I seem to be getting a double dose. 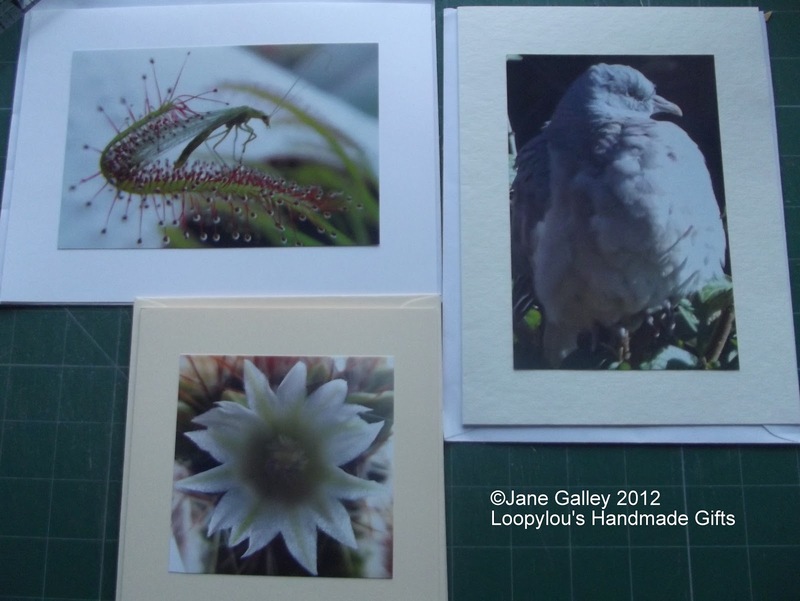 However, despite the temperature, I did struggle to get some more cards made up for Daniel. He was going to an open day, and wanted to take them with him. Now that's done, I am now going to wallow in my misery, tissues and olbas oil at my side. Hopefully, as long as you don't get too close, I won't be sharing it with you. After getting over the fear of restarting picture framing, Daniel wanted me to see what some of his photos looked like mounted. 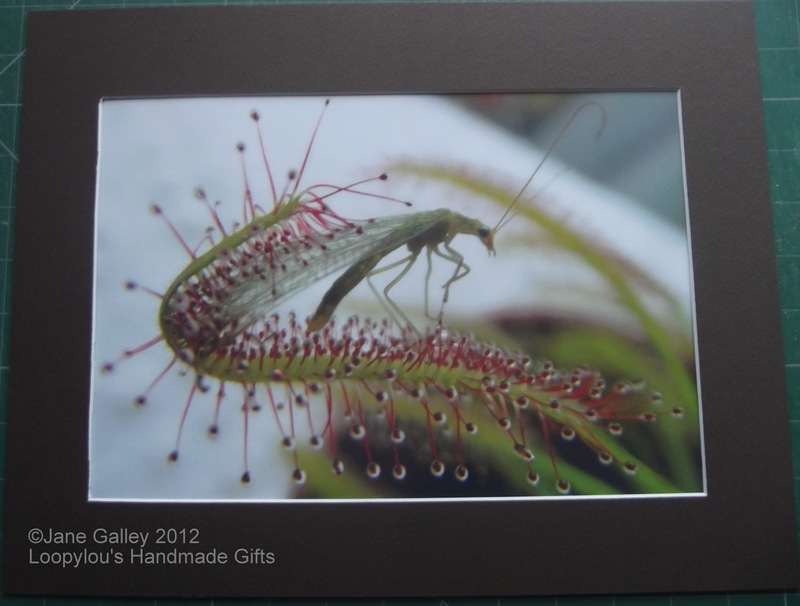 This is a small one, the same as the first batch of cards, but Daniel loves watching his carniverous plants in action. This was one of his favourites, and seeing it on a card, he wanted to see what it would look like enlarged. While he was at college, I enlarged the photo and printed it. A mount was cut, and now, I have two more frames to make. 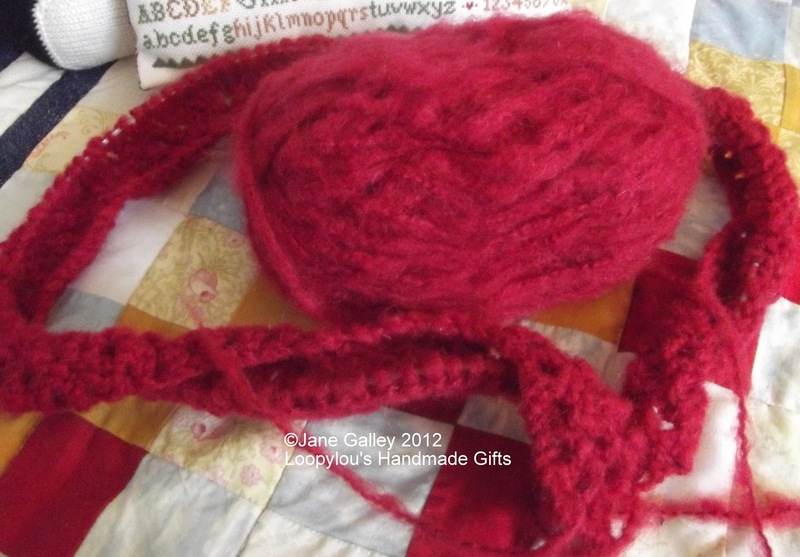 I think the cooler weather is triggering the desire to knit. I've had this cardigan in slow progress all summer, but now, I'm putting in a concerted effort to get it finished. I've never done one like this before, the borders and welts are added last, that's why each piece is curling up. 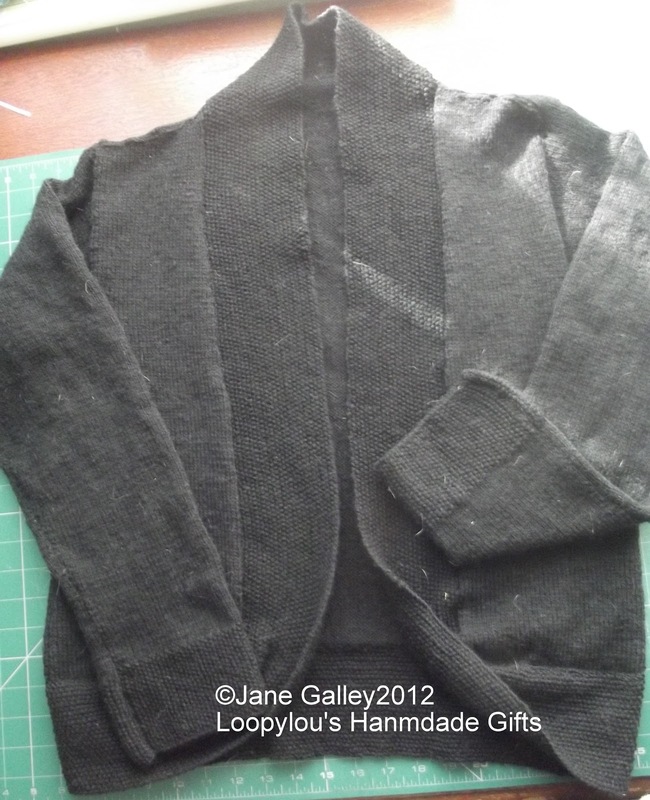 The cuffs on the sleeves are moss stitch, which makes a lovely change to rib. If I can get rid of this cold, I'm hoping I can make good progress with it over the weekend. I have lots of new things I'd like to do. 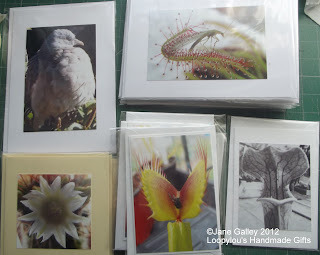 We've been going through some more of the photos, and a few more have made it to cards. We have more to do, but I ran out of cards. I've got a coupon to use, so all being well, we'll go and stock up later today. 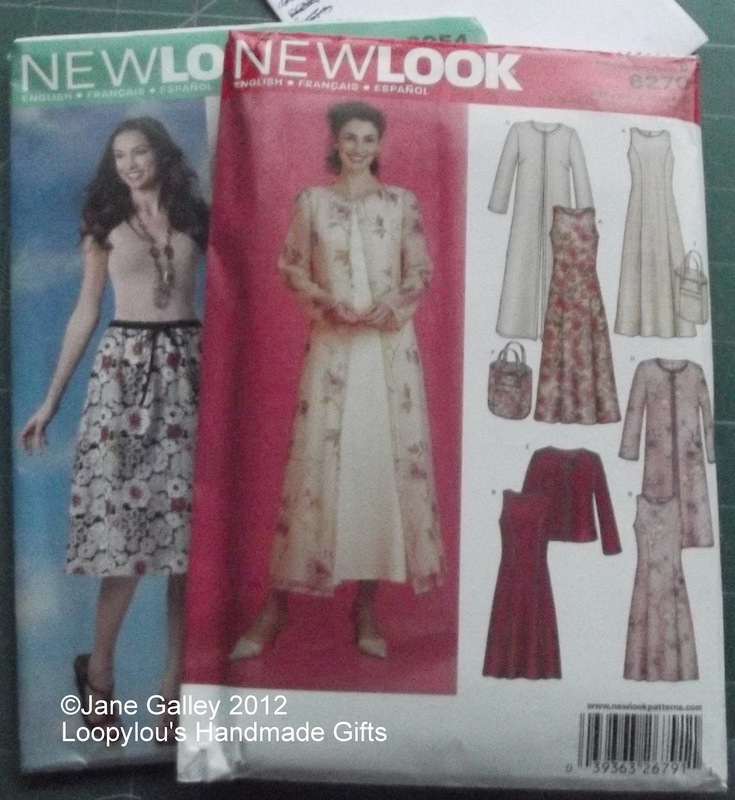 After a totally unsuccessful and frustrating shopping trip last week, I've bought some sewing patterns. There is another one to come for tops. Not so unusual you may think, but you have to realise, I haven't sewn any garments since I was in school. The blouse I made then wasn't exactly a resounding success, and the whole process was such torture, it was a process I never felt I'd like to repeat. 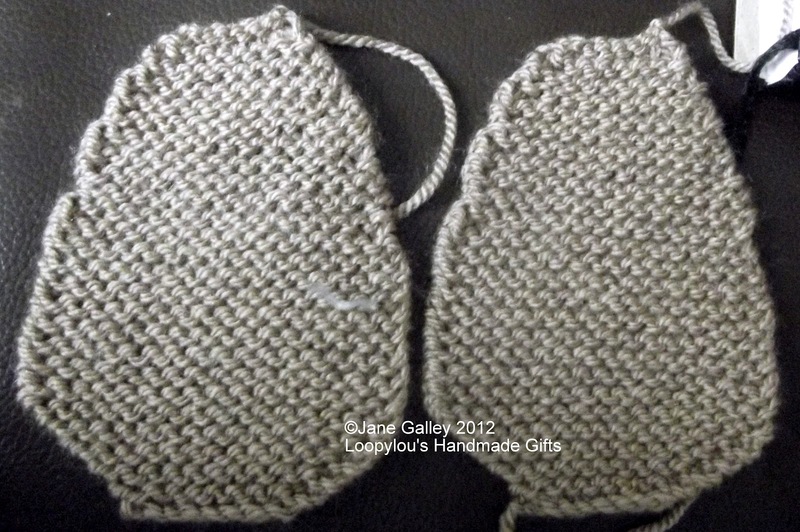 However, the patterns are labelled, "Easy", so I'm hoping I'll get something wearable at the end of the exercise. I may be calling on a few hints and tips from a few blogging friends that make it look easy. 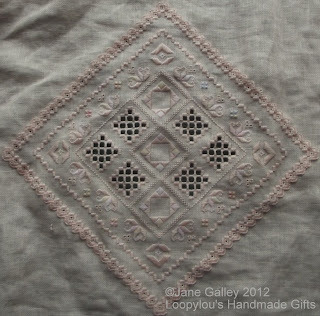 The first hurdle will be to buy the fabric. 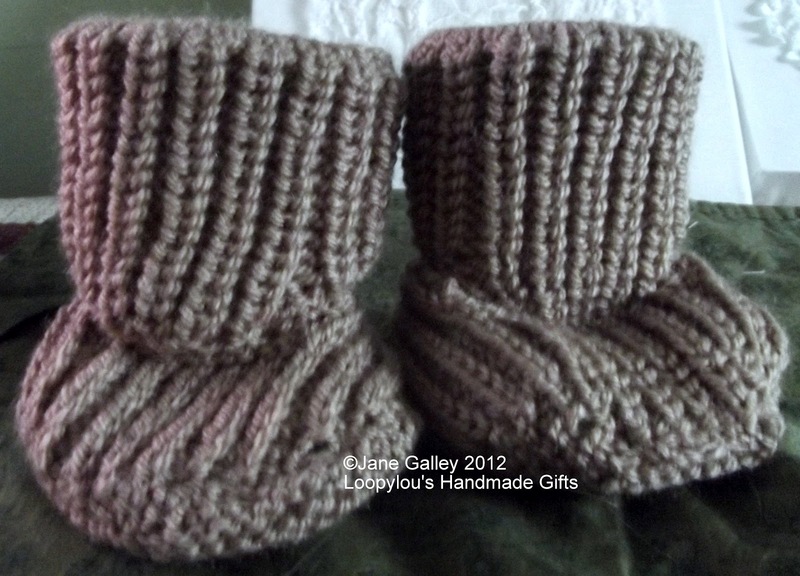 These are so easy to knit, although you end up with lots of pieces to put together, which can be quite fiddly. There three different styles to choose from, this is the long legged fisherman's rib. I just love that the legs are lined. 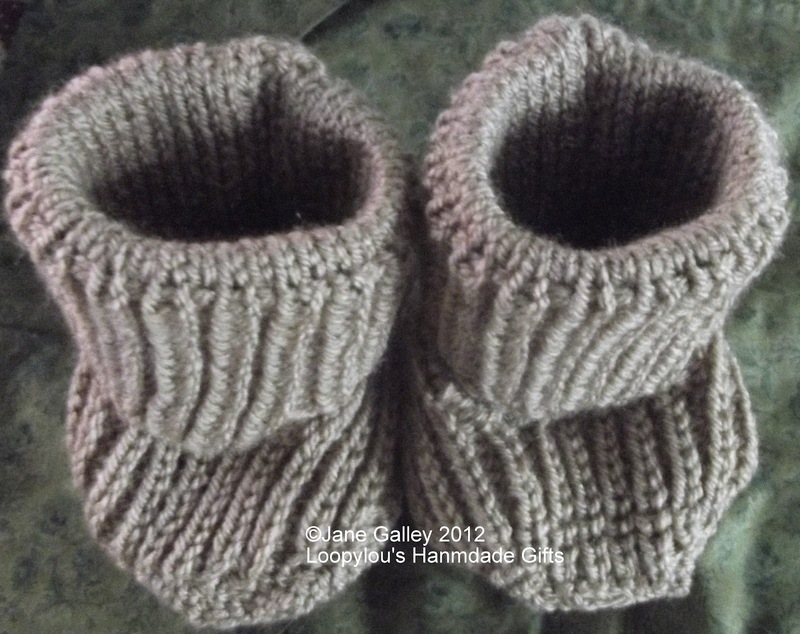 I'm going to try the other two styles, then I'll decide which of them I'd prefer in the adult size. This is going to be fun. 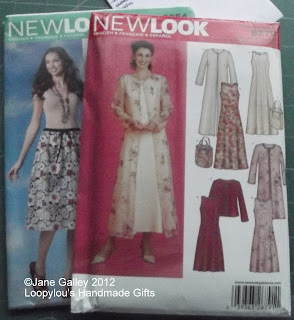 If anyone else wants to join in the fun, the pattern is King Cole 3275 double knit. Sizes go from 1-2years to adult. Just over a week ago, I had an unexpected email from Nancy to check my snail mail address, and to let me know to be on the lookout for a package. It's been one of those weeks, and it slipped my mind until the postman knocked on the door on Saturday. You should have heard the oohs and aahs as I opened the envelope. Everything was packaged in their own little bags and envelopes. It was so exciting to see what came from each one. 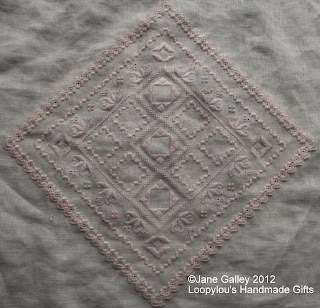 The doily is a delight and I immediately thought of an idea to combine the tatting and the doily. Are you thinking what I'm thinking? Nancy and I were thinking of similar ideas, but I'll show you later in the week, all being well. 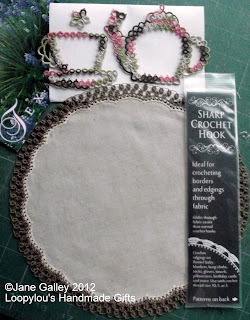 The sharp crochet hook looks amazing, I'm going to try it on my fusion squares and shall let you know how it works. Nancy, thank you once again, I feel very spoilt. Last week, I saw a lovely pattern for knitted slippers. Actually, they are more like knitted boots, but I loved the look of them, I just had to try them. I thought I keep it simple and try the small ones first, if they turned out OK, then I'd do the big ones. These are the soles for the first pair, and they look so sweet! Now, all we need is the uppers, and the legs. Terry was ahead of me this month with her star blocks, but it's still the first week. and a crumb block too. 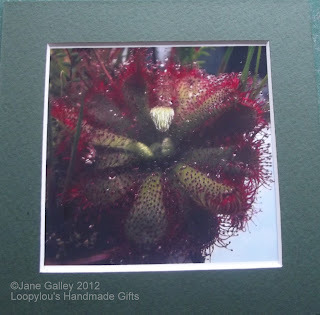 Pop over to Terry's blog and you'll be able to catch up with all the other participants. There is a list on her sidebar of all those taking part. 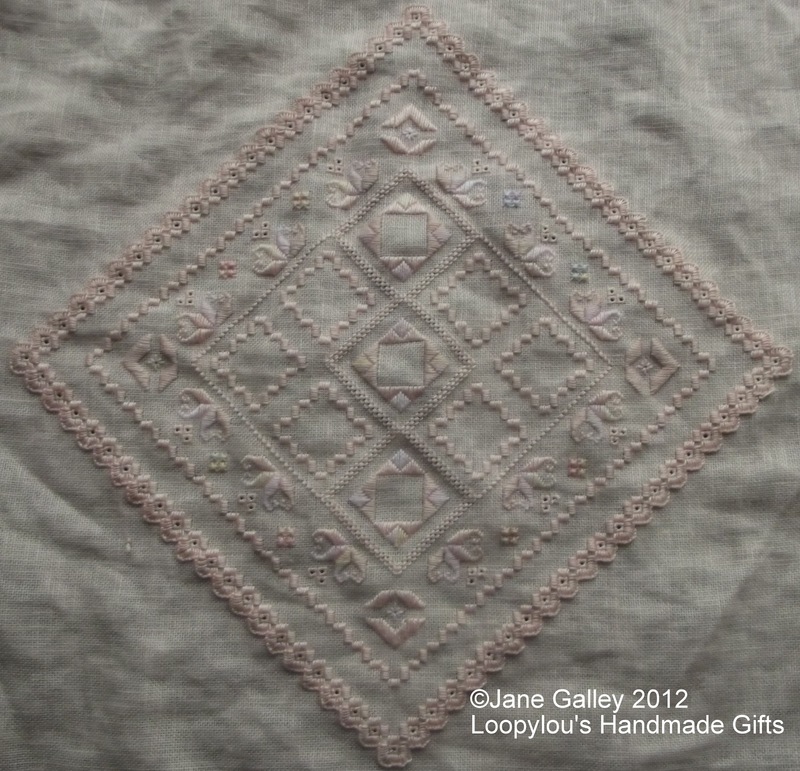 October came a bit quicker than I was expecting, and the September quilt was left hanging, waiting for the hand quilting. 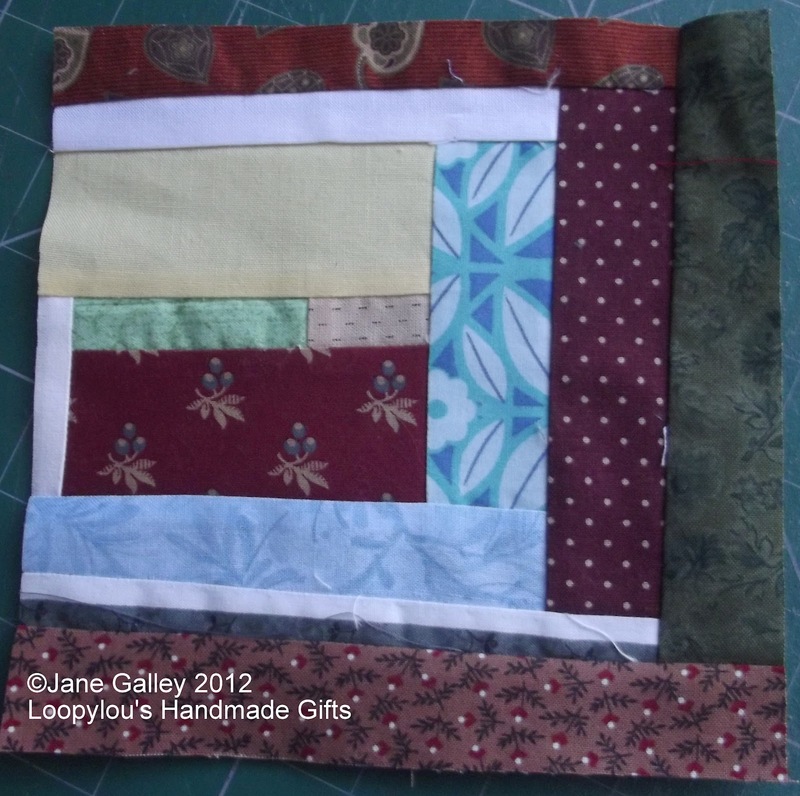 Never mind, it's still only the first week of October, and a bit of hand quilting is relaxing to do. This is the September quilt done, complete what hand finished binding. 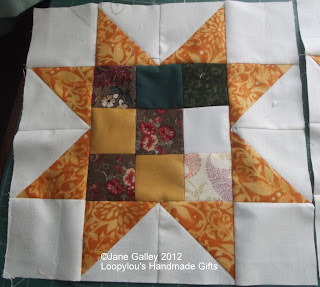 Now there are three weeks to do the October quilt. It should be fun, hexagons are involved. Thanks again to Kathy for her inspiration and generosity in providing this pattern. The border is done and it finishes the blanket off very nicely. 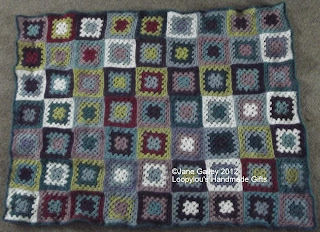 This was done using up all the yarn leftover from the afghan, and has given me an extra blanket, perfect as a lap blanket, or as a baby blanket. That's my crochet projects completed for now, although it shouldn't take too long to find another one. 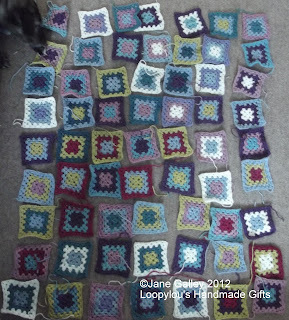 It took a bit longer than I was expecting, but all the squares are now joined. I'll go around the whole thing and finish it with a border. 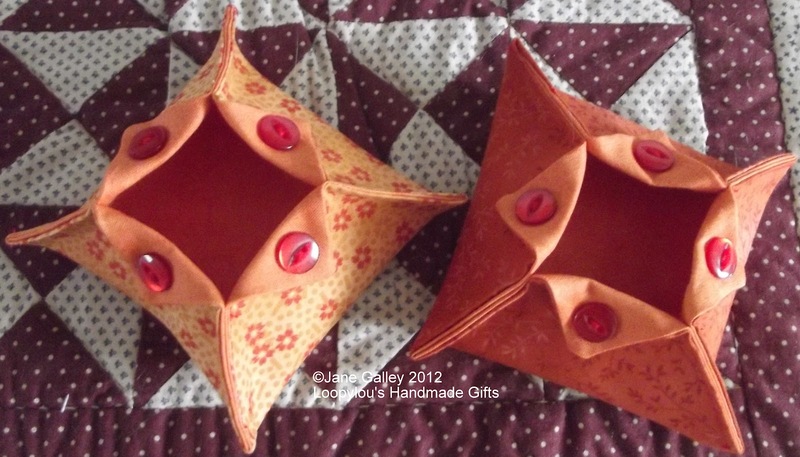 I've been wanting to make these for such a long time, but they've slowly been falling down the to do list. However, Tudy made some the other week and it reminded me to do some. Martha has a great tutorial, and they are so easy and satisfying to make. 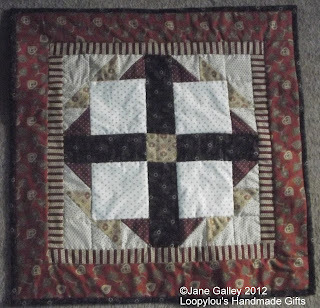 I used 61/2" squares to do mine. 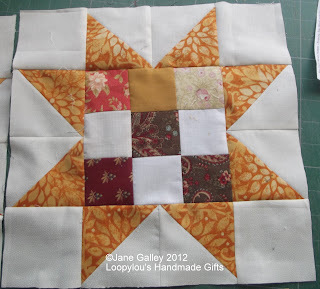 These were supposed to have been made last week, as part of the Orange Rainbow Scrap Challenge, but the cut out squares sat waiting until yesterday. The buttons were found in my button tin, and were the perfect way to finish the points. They were so quick to do, I don't know why I waited so long. 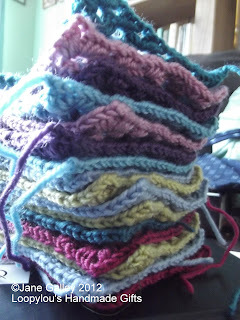 Another session of crocheting yielded another small pile of granny blocks. That's the last of them, so I went and collected them altogether to get a layout for the final blanket. It was changed after this photo was taken, as I had two colours the same next to each other. 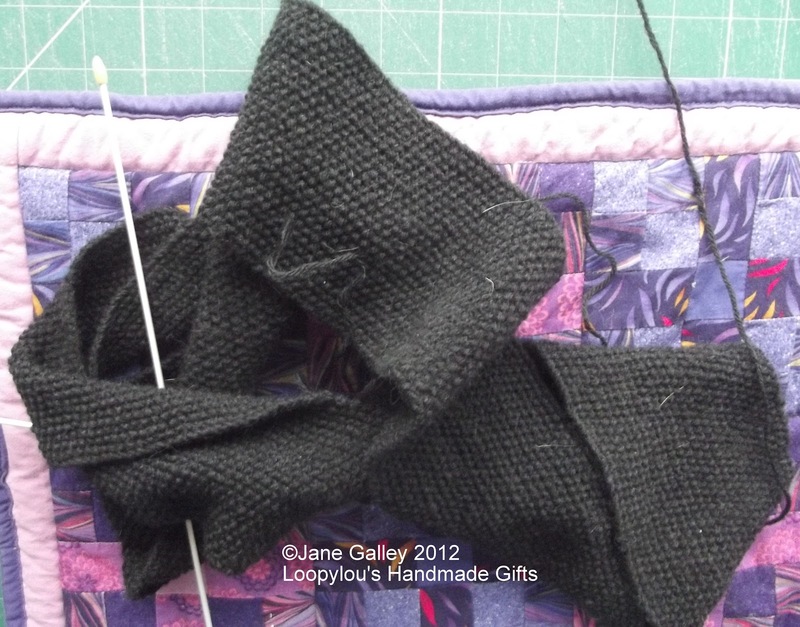 They sometimes get another shuffle as I sew them together, so it will be a surprise to see how they all turn out in the end. I've made a start, two rows are done and joined, only seven more to do.